It’s been a couple of interesting weeks in UK politics since left winger Jeremy Corbyn was elected as leader of the opposition Labour party. However the party as a whole still seems far from certain about what caused its failure in the election and whether moving to the left is the best way forward, for the party or the UK. From my perspective, as someone who doesn't usually vote Labour, but am often attracted by some of their proposals, there are several issues to consider. The charges that Labour wasn’t true to itself and therefore didn’t seem authentic, or that it simply became some form of Tory-lite imitation strike me as being overly simplistic labelling of a number of complex and integrated causes which together led to the results it did. However there is undoubtedly some truth in them too. I certainly didn’t feel compelled enough to vote for what I liked about what Labour were offering under Ed Miliband versus some of the things other parties were offering which I found more compelling still. 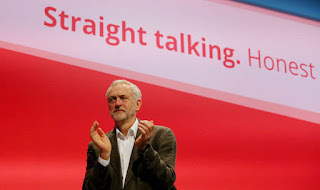 My own reaction to Jeremy Corby is that he’s very clear about what he believes in and is selling his ideas, or more accurately, engaging people to think differently about them, very well. His style and approach, allowing disagreement, promoting discussion, and connecting with the electorate, albeit partly determined by the nature of his election, fit current lifestyles and life views very well. The mainstream media still doesn’t understand how far these things have changed and so attack Corbyn for poor leadership, encouraging even more people to line up on his side. This isn’t to suggest that everything has been handled well, or that I necessarily expect the new old Labour party to win the next election, whether or not Corbyn even survives until then. But I do think it has injected a breath of fresh air into the UK and I’d hope that even if Corbyn gets kicked out after his first speech as leader today, that he feels he’s already had a few small successes, in particular challenging the ‘theatrical’ nature of UK politics and helping people see that there are other options to austerity in the way we continue to develop the UK’s economy. And I think HR can learn some lessons from all of this as well. Firstly, I think we’ve been playing a new-Labour-like game for far too long - accepting existing business paradigms about managing organisations. Yes, we need to work within a capitalist economy and help businesses deliver higher returns from their shareholders. But no business will do this well if that’s their only goal. Our support for capitalism needs to be complemented by a more social - if not socialist - way of operating. For example we need to care for and show our care for our people, supporting those on zero hour contracts as well as those we deem to be our talent; we need to design our workplaces, processes and jobs around our people as well as to achieve business goals; and we need to involve all of our people in deciding what we are going to do. Corbyn’s election and growth in the Labour party membership since he was elected give some indication of the energy which can be unleashed by treating people as people and not simply as workers used to do what a business decides it needs. A second, potentially even bigger, lesson can be learned from the way Corbyn got elected too. As all readers in the UK at least will know, Corbyn dispensed with new Labour’s attempt to suggest that we can create a more caring approach to people within the existing paradigms about businesses and our economy. For him, we need to intervene more and not just rely on the market to always lead to optimised results; we need to enable everyone to succeed and not just accept that growing inequality is a fact of life; and if we enter another recession we need print money not just to save the banks but to protect people and build for the future. Thirdly, Corbyn also made an appeal to the whole organisation, inspiring people at the bottom rather than just influencing those at the top. HR doesn’t have the advantage of Labour’s bizarre election rules but we can still do more of this ourselves - connecting with the employees in our organisations, and using these relationships to show how much we’re valued and needed - though of course this will only work once we’ve changed our perspectives and behaviours, and start focusing at least as much on enabling our people as we do in supporting managers to make people do what our businesses require. If we start thinking more like this, then I think HR, just like Labour under Jeremy Corbyn, has a chance to be more successful - and by changing the way that organisations run will make our businesses more successful too. It’s certainly not the prevailing paradigm for how HR needs to operate but I think it could work and I suggest that Corbyn’s success should give us more confidence to try it out. For the sake of full disclosure, I’m not a Labour party member, didn’t vote Labour in the general election or in the Labour leadership ones. However my political beliefs do often align with the left (see my largely ignored petition / pledge on change.org) and therefore sometimes with Labour’s too. If there was an election tomorrow, I'd still not vote Labour but I'd be much more likely to vote for them under Corbyn than I was whilst they were led by Ed Miliband. Oh, and I don't sing God Save the Queen. 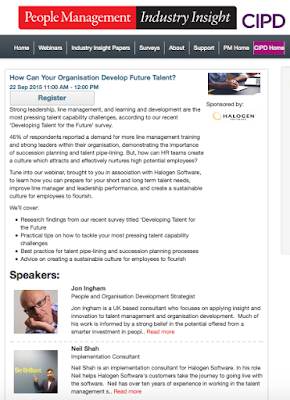 I've added one more event where I'll be talking about talent management to my agenda. 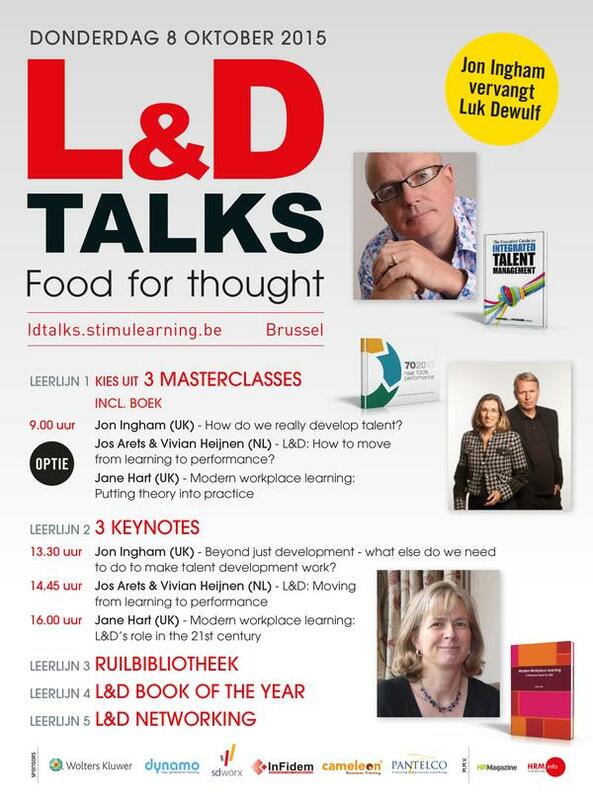 This is Stimulearning's annual L&D Talks in Brussels on 8th October where I've stepped in for LukDewulf to present alongside Jos Arets, Vivian Heijnen and Jane Hart. 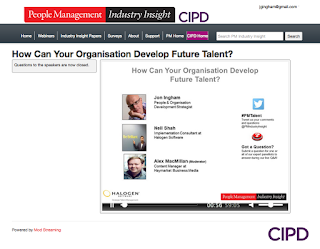 Masterclass - How do we really develop talent? Talent is becoming ever more important for individuals and organisations but our success rate in developing it is not making that much progress. Therefore business leaders in many organisations are becoming increasingly frustrated about L&D’s ability to influence potential, progress individuals up the hierarchy or to other positions where they are most needed, and to increase the organisation’s stock of human capital. We urgently need to address this growing disconnect between the importance of talent and our ability to create more of it. The good news is that as a result in progress in neuroscience, behavioural economics and other areas we have access to an increasing amount of rich insight about how talent can be developed, and no longer need to rely on old but often flawed ideas such as learning styles. We can therefore start to get to the heart of what does make a difference to talent and therefore organisational performance. In this interactive session Jon will present an overview of some of the key insights we can and need to use to inform our plans and practices to develop talent, and will then open up the debate to all participants to share ideas and experiences and try to come to some conclusions about what we can do differently. Jon will close the session by pulling these ideas together and suggesting some ways to introduce these ideas into talent development programmes within the participants’ organisations, and also to ensure that L&D practitioners are able to leverage and optimise their own talent themselves. 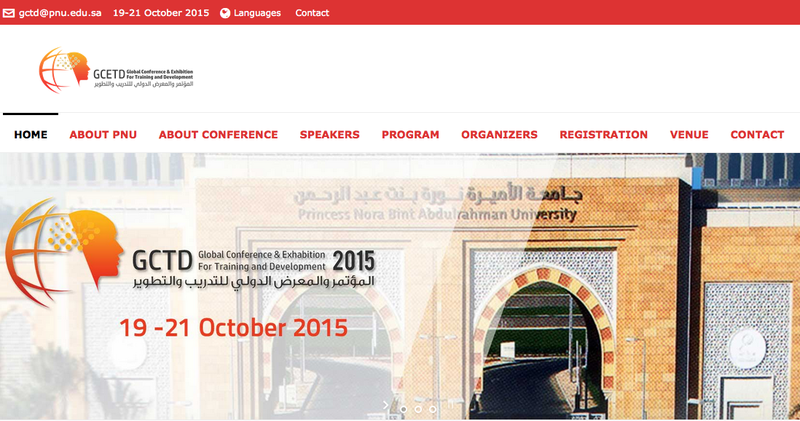 Keynote - Beyond just development - what else do we need to do to make talent development work? Making talent development effective and placing it at the heart of a strategic approach to talent management requires more than just being able to develop talent well, difficult enough though that is. We have a number of other demanding and in fact increasingly difficult challenges to confront. For example, who, or what is talent? - do we really understand the attributes we need to create and which roles or individuals demonstrate them? Are we able to identify talent effectively - what are the mechanisms we need to use to assess talent and identify which individuals fit this description? And how do we ensure that the whole team and organisation is learning effectively? Jon will provide some suggested answers to these and other questions and provide other strategic but simple and practical suggestions for how L&D practitioners can power up their talent development and broader talent management approaches. If you're in Brussels, it'd be great to see you there! 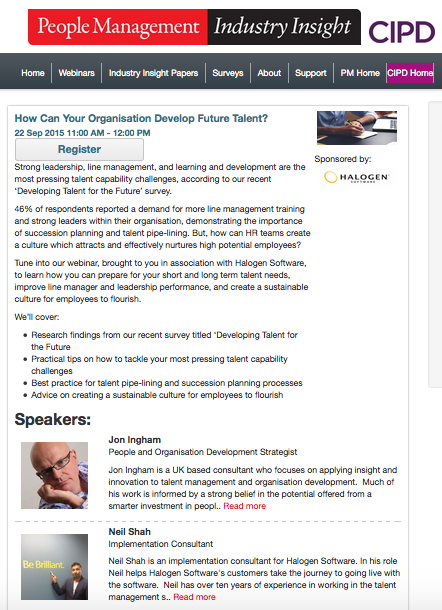 One of the things I talked about in the People Management webinar was the increasing focus on small numbers of talent (eg Halogen's survey showed a clear focus on senior managers and leaders) and whether this is always valid. I think workforce segmentation is a very appropriate activity, most of the time, and that most organisations do have 'special ones' but I worry that we overemphasise the variances in their contributions. This relates to suggestions that, eg, the best people deliver 500 x the value of an average employee and to actual responses to it, eg, the ratio of CEO salaries to average employees (183 x for the FTSE according to the High Pay Centre). 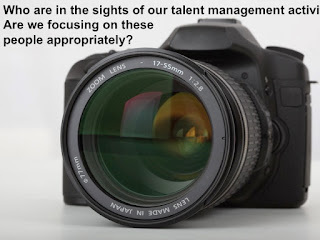 That impact of our focus on talent is ever more marked as we also differentiate disproportionately against those at the bottom or the weakest performance in our organisations (the 'smelly ones' perhaps?). I worry that the variance in the deal between those identified as talent and those on zero hour or similar contracts is increasingly tearing the social fabric of our organisations. None of this detracts from the importance of talent or talent management but it emphasises the importance of identifying talent and investing in them very carefully, and that we position these people within the rest of the organisation even more carefully too. We need to be especially on our guard when respected commentators who should know better say bizarre and inaccurate things such as that '2% of the people in a business drive 98% of the impact' - as suggested by Ram Charan in his recent HBR article and repeated at the AHRI conference in Melbourne where were both speaking. How does a comment like that get into the Harvard Business Review??? It's easily and visibly not the case in any organisation I've ever worked in, and in any case, if it ever was, the issue wouldn't be talent management but organisation design! Ie if 98% of your employee population deliver that little value, the issue isn't focusing on the 2% it's about reorganising and restructuring around the 2%, becoming a much smaller but much more effective organisation, with the small amount of additional value provided from outside of the organisation. 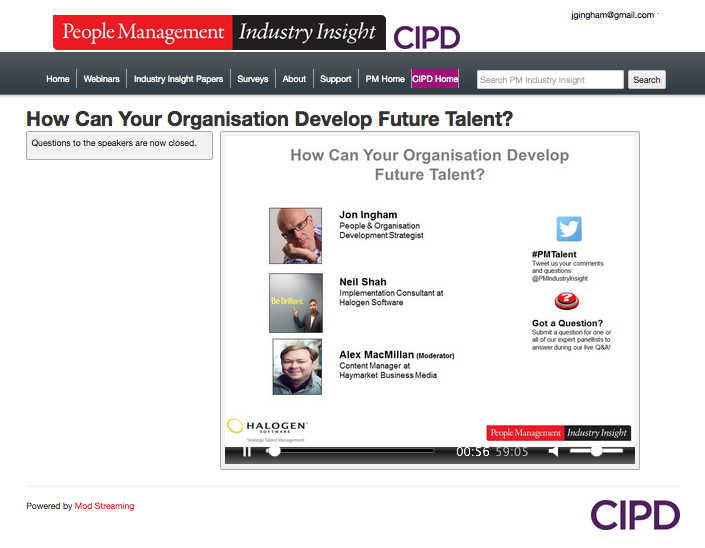 I delivered this webinar with the CIPD's People Management magazine and Halogen Software earlier this week. Thanks for everyone who attended and particularly all the questions. If you've got any additional questions, you can always ask them here. Whilst the link between HR and Property seems much stronger in Australia than it does in the UK, the rest of Europe or just about anywhere else I've been, there's clearly more we can do. Part of the issue is that HR needs to develop it's understanding of workplace design so that we can work with our Property / Facilities colleagues more easily. And part of it is to be able to link what's possible in these areas to what we're doing in HR. I think this is more than the suggestion in Melbourne that HR's job isn't to choose the colour of the chairs but to integrate this into the rest of the culture. As owners of the culture, we do also need some capability to direct and lead what happens in the workplace as part of our broader organisation design. I got into some of this agenda in Fleming's Smart Workspace Design conference earlier this year. Human Resources, Corporate Real Estate and Information Technology functions all have similar remits and attributes - the most important of these being that we all need to focus less on what we do than on what we create. The input to this session will argue that once we have established what we want to develop (for example innovation, collaboration, fun etc), all three functions need to be harnessed and integrated together if meaningful change is going to take place. It sounds simple but in last year’s conference we found true integration is very rare indeed. So how can we connect HR, CRE and IT to the outcomes we need to create? Examples of organisations aligning their overall designs behind a required culture or capabilities. How can we ensure that a workspace reflects the company’s culture and communicates its strategic requirements for example supporting employer branding? How do we integrate workspace, IT and HR policies to create an omni-employment experience? What are some practical examples of strategies for enhancing collaboration across HR, Facilities and IT, engaging members of other disciplines in the broader picture and your own part of the agenda? The journey is many organisations is to become more human (leave aside those for a moment which just want to reduce their costs). How can HR, CRE and IT work individually and together to enable people to be people, for example by responding to different national cultures, generational differences and individual personalities etc? It should be a really good session, and a great conference, so do have a think about whether you're going to be able to join us. I'm hoping we'll have more HR people than Property people there this year. 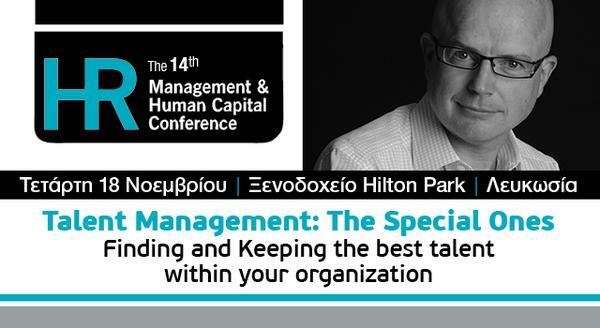 I'm also looking forward to speaking in Cyprus in November at IMH / PwC's Human Capital conference, this year focusing on talent management - finding and keeping 'the special ones' within an organisation. 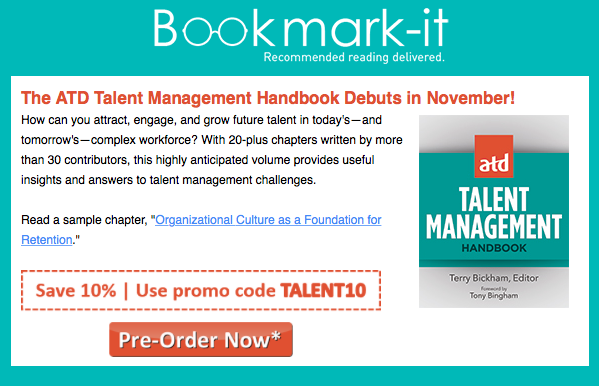 The ATD's Talent Management Handbook will be out the week before, so it looks like I'll have a fairly heavy focus on talent around then. 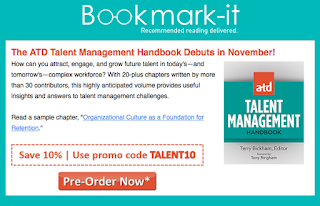 I'm a contributor to the ATD's Talent Management Handbook, due out in November. Well, although there is a lot of talk about “the new pay", there is not that much difference between the new and the old as of yet. Pre-order the book now - use promo code TALENT10 for a 10% discount on the price. I'm doing this webinar for People Management on 22 September. Do join me if you can. I was there to talk about zero hour contracts, supporting the ONS's new figures showing the number of people on these contracts has increased from 2 to 2.4% of the working population over the last year. See this BBC report on the data. But actually that's fairly dull - what is more interesting is data on the quality of these contracts, for example the findings from Glassdoor's survey which I blogged on last month. In this post I suggested that the growing popularity of ZHCs demonstrates a predominance of a low skill, low pay economy, rather than the higher productivity one we're trying to create. So I thought it was a bit unfair that the tweets during my interview suggested I was gushing or talking 'twaddle' etc. But actually even though I was asked to present a balanced view in the interview, the Glassdoor findings are pretty damning. So OK, 40% of unemployed people would take a ZHC, and 25% of these see the flexibility it gives them as a positive. But most of these would only take it because they need the money or for other reasons feel they have no choice. Also 40% of respondents wouldn't take one, as they need more predictable income or a guaranteed amount to maintain access to benefits, or simply because the offer of ZHC reduces their overall trust in an employer, or because they're influenced by negative reporting in the press. 45% see them as exploitative. It's not that ZHCs are inately negative. I tried to make that point in the interview - if you compare Glassdoor feedback on McDonalds and their ZHC and Sports Direct and theirs, you get a very different kind of commentary. So it's not the contracts themselves, it's the philosophy behind them, and the way they're implemented which counts. Eg do ZHC staff get lower pay, less acccess to benefits or bonuses etc, in which case you're very likely to create a two tier workforce. Or are staff given flexibility in choosing the dates that they want to work, in which case they're going to be perceived very differently. But the reviews on Glassdoor*, the findings of this survey, the general commentary in the news as well as the more specific tweeting (with that one exception at the top) are very negative, and to me, that indicates that most employers using ZHCs are doing so simply to reduce costs, with very little thought about their staff. That's the real problem here. And it's why I think employers which are using ZHCs need to take notice of Glassdoor's employer reviews and these survey findings, and the impact that the perceptions of the contracts are likely to be having, and probably get rid of them, or at least limit them to specific areas of the employment population, and to time periods where they're truly necessary, and where possible to replace them with something like annualised hours etc. * By the way, I do think the reviews on Glassdoor are the main things here. The Glassdoor survey has come out with some very different conclusions to the CIPD one a few years back. That might just be because perceptions have changed over that time. But surveys are only ever an indication of a general mood and belief and will always be influenced by the specific questions which are being asked and many other things. It's the real, anonymous and therefore authentic but specific feedback on Glassdoor's site which to me provides the most powerful insight into peoples' experiences and perspectives.